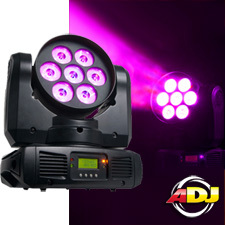 This unit is compact & light weight and offers plenty of pro features such as: 2 DMX Channels for programming and a 4-Button LED DMX Menu. The Inno Color Beam Quad 7 is also great in sound active mode with plenty of exciting built-in programs creating instant light shows. Plus, non-DMX users can use the easy-to-use UC3 Controller to operate this fixture.